Julie Martin is the director and founder of the Jump Start Comedy Improv Troupe. She brings 12 years Improv directing, performing and teaching experience; along with 25 years front of the room presenting to her teaching and coaching. Julie has taught countless students, bringing them from the classroom to the performance stage in her Jump Start Comedy Classes. She holds seminars and workshops teaching the mastery of improv fundamentals, scene building, and out of the box comedic thinking. She coaches professionals in public speaking, confidence and communication skills. Julie’s optimistic, inspirational, seasoned presentation style is a signature of her improv classroom. She creates a super safe, step by step developmental learning environment that is fun, collaborative and encouraging. 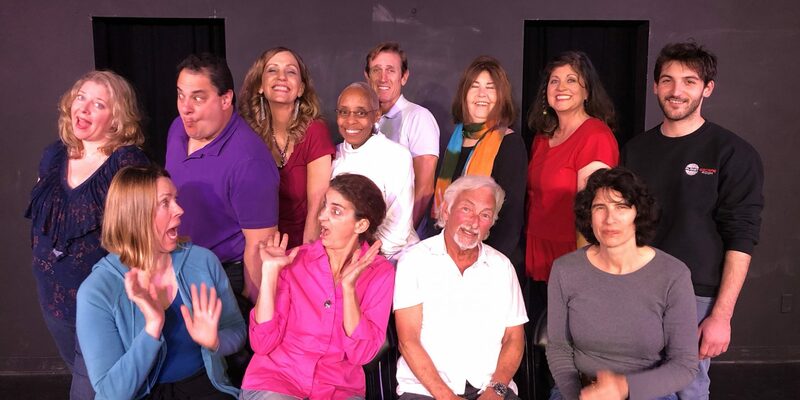 Find your improv comedy confidence as you learn using cutting edge progressive exercises featuring visual thinking and mind mapping. Julie teaches from the perspective of mindfulness, plotless improv, and helps students find their natural, spontaneous funny in the present moment. Julie assists clients, students, professionals and executives to train their brain for focus, concentration, deeper listening and increased discernment in communication and comedy. Julie would like to thank all the students who taught her to be even better, and her teachers who inspired and taught her along the way. Thanks to teachers April Scott, Rich Talarico, Miles Stroth, Stan Wells and many others. Thanks to the Westside Comedy Improv Program, where she is a graduate. You’ll find her mentoring, performing, directing, leading corporate seminars, teaching Jump Start Improv Classes; or laughing and enjoying life as the biggest ‘Yes, And’ comedy stage.